Competition is the hallmark of a thriving industry and Acumatica customer Tayse Rugs has figured out that running leanly can give them a leg up. 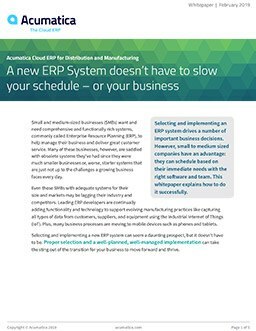 The company implemented Acumatica cloud ERP and their journey—like customers Superprem, Specified Technologies Inc., Ray Allen Manufacturing, and Berthold Technologies—has been successful. When you think about ways to gain a competitive edge, you probably think about how to make your front-facing product or service better. But have you considered how your back-end system impacts your ability to compete? It does. Taylan Sevimli, Business Development Manager at Tayse Rugs, understood this concept when he joined the family business and implemented Acumatica cloud ERP, resulting in streamlined operations and an increased bottom line. Tayse Rugs imports and wholesales machine-made rugs. They offer a wide variety of styles, shapes, and colors with names like Avon, Berkshire, and Capri. Their clients include popular box stores, such as Home Depot and Walmart, and eCommerce companies, including Amazon, Overstock, and Wayfair. To run the successful business, Tayse Rugs was using QuickBooks Enterprise, and it worked until their incredible growth—which includes adding their furniture division, Ada Home Décor—overwhelmed the software’s capabilities. So, Taylan began researching his cloud-based distribution management and financial management software options. “I researched for more than a year,” he says in his Customer Audio Board recording. Additional incentives for Taylan included Acumatica’s unlimited user licensing model, continual upgrades, and strong developer community. Having made the decision, he was assisted by Joel Gress of Dynamic Tech Services in implementing Acumatica’s Financial Management Edition and Acumatica Distribution Edition, which Taylan says was a smooth process. Tayse Rugs also worked with Acumatica partner B2BGateway for their EDI requirements, which have grown in complexity as they continue to add more and more customers, and with Acumatica partner Descartes Systems Group, Inc.’s OzLINK Shipping Solution for parcel shipments. The seamless integration with these and other third-party applications allows them to automate and customize their processes, saving time and effort. “What we can do with two people, our competitors need 7 or 8 or even 12 to handle the same order amount,” Taylan says. As Tayse Rugs expands their operations, including recently moving into a 300,000-plus square foot warehouse, they’ll rely on Acumatica’s cloud-based distribution management and financial management software to keep them running efficiently, profitably, and competitively. Acumatica’s modern products and open platform can do the same for your organization. We encourage you to contact us with questions and for a demonstration. We’ll highlight the reasons Acumatica placed highest in Usability (among 22 leading ERP vendors) in Nucleus Research’s ERP Technology Value Matrix 2018 report and highest in User Satisfaction (out of the 12 cloud financial solutions that were surveyed) in Gartner’s recent Magic Quadrant report.